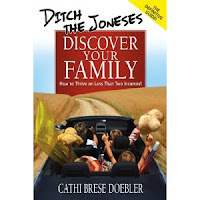 Ditch the Joneses, Discover your Family, How to Thrive on Less than Two Incomes by Cathi Brese Doebler is a book about planning, learning and adapting to living on one income. The author is a Mom who knew before she even had children that she wanted to be a stay at home mom. She and her husband started making plans before her boys were born so that the could survive and thrive on one income. By planning and understanding what it takes she started to do more and more research on others desires to stay home and their struggles. Doebler took this information and started teaching classes to other parents on how they could try to be home with their families more. Throughout this book Doebler talks about everything from Planning before your first child is born, the savings you actually do make by staying home and not paying for childcare and work expenses, ways to save money when you are home, and how to keep in touch with the business world if/when you want to return to work. She also talks about defending your decision to those who may not understand your desire to stay home. When I left the corporate world I knew that there were people who would not understand why I would want to be home 24/7 with little children when I had this great paying job and daily adult interaction. This book reminded me that there are always going to be people who don't understand your decision to stay home and that you have to do what makes you happy, not everyone else. Doebler also points out the importance of continuing to network in order to maintain future employment opportunities, reaching out your community as well as spending time with other new parents. Even though you chose to stay home with your children does not mean that you have to cut out everyone who is not in the same situation as you may be. Keeping in touch is the key to future options. I really like how she also touches on how to keep your sanity when you do cut your hours or stay home. She reminds you that you cannot do it all and to take time to ease into your new situation. Not to assume now that you are home that you can attack that "to do" list in a week. You are home to raise your children and be there for them, not necessarily there to make sure your house looks like Martha Stewart's house (my words not hers). This is a great book and resource for parents wanting and hoping to make that leap into a one income family. It is a reminder that we are lucky to be able to stay home and that there are so many others out there that want to be in your shoes. With the right planning and resources in most cases it can be done, this book can help you achieve that goal. You can buy Ditch the Joneses, Discover your Family, How to Thrive on Less than Two Incomes by Cathi Brese Doebler on Amazon or you can get the Nook Book version at Barnes & Noble.